After several years of delays and setbacks, Amylin Pharmaceuticals has received FDA approval to begin US marketing of BydureonTM. 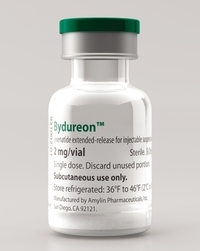 The first once-a-week type 2 therapy to be offered in the US market, Bydureon is expected to be available by February. Amylin says that its wholesale price will be about $4,200 a year. The drug is a longer-lasting version of Amylin’s popular drug Byetta, which is injected twice a day and was introduced into the US in 2005. The company was assisted in developing Bydureon by Alkermes, an Ireland- and Massachusetts-based biopharmaceutical company that developed the technology allowing Bydureon to be slowly released inside the body over a seven-day period. Bydureon, like Byetta, is classified as a GLP-1 receptor agonist, meaning that it mimics the effect of a hormone that increases insulin production when blood sugar is high. Both drugs are based on exenatide, a hormone found in the saliva of the poisonous Gila monster. Unlike Byetta, however, Bydureon has not been approved for use in conjunction with insulin. In a head-to-head comparison between Bydureon and Byetta, patients taking Bydureon experienced a 1.6% reduction in their A1C after 24 weeks, compared with an 0.9% reduction for patients taking Byetta. Both study groups lost weight-a welcome side-effect of exenatide-with the Bydureon users shedding an average of 5.1 pounds versus 3.0 pounds for patients taking Byetta. Amylin is hoping that type 2 patients who do not like the idea of daily injections of a GLP-1 drug will switch to once-weekly Bydureon. The drug also addresses the concerns of healthcare providers that many diabetes patients don’t take prescribed drugs because of the hassles involved in tracking injections and oral medications. The drug’s chief marketplace rival is the recently introduced Victoza, a GLP-1 receptor agonist from Novo Nordisk that is injected once a day. While Victoza requires a greater number of injections, the needle used for the injections is smaller and reportedly easier to set up than the one used for Bydureon. Previous delays in FDA approval of the drug centered on concerns that Bydureon might contribute to heart rhythm abnormalities. Currently, the agency is requiring Amylin to conduct a clinical trial to determine whether Bydureon increases the risk of heart attacks and other cardiovascular problems, as well as thyroid cancer and pancreatitis.